Land of Sleep realizes that trying something new is often difficult. Here are some of the questions our customers ask most often about adjustable beds. We want you to feel comfortable with your decision to try a better bed. Imagine how much better you'll feel when sleeping on a new bed designed for your comfort! Do adjustable beds offer any health benefits? 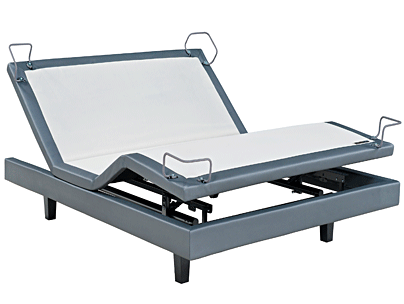 An adjustable bed provides some relief for several common health conditions. Because you can adjust the bed for a wide range of sleeping positions, many people find relief for poor circulation, back and body pain and acid reflux. What kind of mattress do I need with an adjustable bed? Land of Sleep adjustable beds will work with whichever mattress best suits your taste. Take your pick from our selection including innovative memory gel and SFX foam mattresses from industry leaders Serta, Beauty Rest and many more. Will I need to buy a new box springs for my adjustable bed? No. Your new adjustable bed doesn't need a box springs. With an adjustable bed, all you need is a comfortable mattress and you are ready to go. What about a bed frame? A Land of Sleep adjustable bed will fit inside your existing bed frame but does not require one for stability. The legs that raise and lower the bed are all the support it needs. How do I change the positions of my bed? It's easy to change the position of your Land of Sleep adjustable bed. Our store personnel will be glad to demonstrate the remote controls that allow you to put your new bed in any position you like. You can even put it in a position simulating the way astronauts sit at lift-off. Those who suffer poor circulation or chronic back pain often find relief with this adjustment setting. Millions of Americans wake up every day with body aches, back pain and just plain feeling rotten. If this is you and you're ready to do something about it take Land of Sleep can help. Stop by one of our stores in Sarasota or Venice and discover the difference a good night's sleep can make. We carry a wide selection of adjustable beds and mattresses especially designed to put your night time comfort completely in your control.